5 a day portion size 1/2 can drained. Nothing beats the flavour of British peas. We source the very best so they're full of taste. 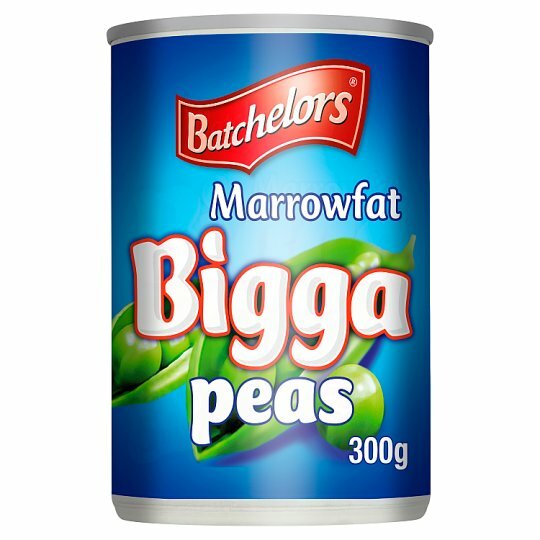 They're great in many recipes but our bigga peas are the perfect partner for fish 'n' chips. Cooking Instructions (General): It's easy peasy! Hob (From Ambient): It only takes a few minutes to heat me in a pot on the hob. Empty contents into a saucepan. Heat gently for 3-4 minutes, stirring occasionally. Do not allow to boil. Microwave (From Ambient): 750W: 2 1/2 mins. Place contents in a microwaveable container, cover and vent. Microwave on full power for 1 1/2 minutes, stir and re-cover. Microwave on full power for a further 1 minute. Allow to stand for 1 minute and stir before serving. For higher wattage microwaves heating times should be reduced.